As a media server application, Plex enables us to share music, movies on TV, PS3, PS4, Xbox360, Android, iOS, and other DLNA-certified devices locally via home network connection, or remotely, as long as you have a Internet connection. But you will find it a painful experience to play MP4 files via Plex. And you may encounter problems ‘Plex not detecting MP4 files’. So in this article, we will show you reason and solutions to solve Plex Not finding a MP4 movie problem. Method 1: Firstly, make sure you’ve added the directory to your library and updated it. Since Plex requires a special naming convertion for TV shows in order to download the metadata of them properly, if your MP4 videos are TV shows, please try to rename the MP4 files so they have simpler names (e.g. Series – S01E01 – Episode Name). There is another solution. We can make a new library or pick Other or Personal Media and put the MP4 TV shows in there. After that, these MP4 files will show up and be streamed to TV. Method 2: If your MP4 files are not accepted by Plex, it’s probably because of the video codec incompatibility. In this situation, the easy option is to convert incompatible MP4 to Plex supported MP4 for successfully playback. As a free MP4 decoder and encoder, Handbrake will help you to re-encode video or audio track to make it more compatible with Plex using optimized settings. However, though you have converted MP4 source by Handbrake, sometimes you still cannot play and watch them on your iPhone, iPod or iPad through Plex server. What’s worse, the output videos are usually not in good quality as you expect. You need an alternative too instead. Method 3: Along with help from Pavtube Video Converter you fill the compatibility gap between MP4 and Plex easily. Overall, it is one of the best video encoding and decoding apps for Plex. It assists you to convert a wide range of video formats including MP4, M2TS, WMV, MKV, FLV, (4K) XAVC, AVI, VOB, MXF and more to Plex video format for playing smoothly while keeping the original video quality. Plus, it also provides hundreds optimal presets for Apple TV, iPad, iPhone, Galaxy Tab, Amazon Fire TV, Samsung TV, etc to satisfy your diverse needs. What’s more, with its built-in video editor, you can personalize and retouch your videos in clicks. If you are using a Mac user, please turn to the Pavtube Video Converter for Mac, which supports converting MP4 files for playing on Plex on Mac. Here is a detailed guide on how to convert MP4 to Plex supported video in order to successfully play MP4 on Plex with no restriction. Launch the best MP4 to Plex video converter and click the add button to load MP4 files. If necessary, you can double click the each file to have a preview. Click “Format” and select the format you want from the drop-down list. To convert MP4 for Plex, just choose “H.264 HD Video(*.mp4)” from “HD Video” as the output format which is friendly format for Plex. 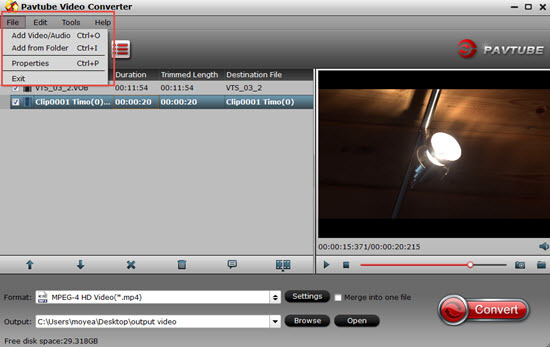 Click “Convert” button; it will encode MP4 files to Plex supported file type immediately. You can find the process in the “Conversion” interface. Let the program do the rest things. Watch out! Converting a full quality MP4 movie to Plex file can take minutes, depends on the size of the file and the speed of your Mac. Open Plex and import the files into the library and use local network to stream from Plex with your iPad, iPhone, Roku, Xbox 360, Xbox One, Chromecast, etc. PS4 Media Player Not Playing MKV Files from USB or Media Server, Solved! How Do you Upload Canon 4K recordings (MOV/MXF/MP4) to Dropbox?